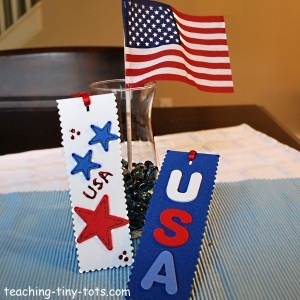 Here is a very easy toddler activity using red, white and blue foam to make a simple bookmark. Add a child photo in the center star to personalize it. Red, White and Blue piece of foam. Foam Stars (There are pre-cut foam stick on stars at craft supply stores or make your own from two of the colors. Choose which color will be your bookmark and cut approximately 2 1/2 inches x 6 1/2 inches or size of your choice. Using a pencil, draw the lines for the bookmark. With assistance, have your child cut on this line with craft scissors. Glue or stick stars on in the other two colors. Ex. If you selected white as your background, use red and blue stars. Decorate with different size stars to create interesting patterns. Use glitter glue to add sparkle. Punch a hole at top of the bookmark. Fold ribbon in half and slide the ends through the hole. With the closed end of the ribbon, loop it over the two loose ends and tighten. Add a photo to personalize. Use foam with sticky backs for the easiest way to decorate. Great even for young toddlers. They even sell pre-cut bookmarks in a pack if it's for a classroom activity. 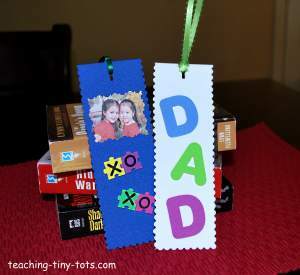 Make a bookmark for dad...find a book Dad will enjoy for Father's Day. Use foam letters, glitter glue or a special photo to decorate. See above for detailed instructions.